It’s Sunday, and no rest day for the writer. The notebook my friends’ gave me for inspiration is open on the table. The lines in the book are made of Jane Austen’s Emma written in teeny tiny letters. Being Sunday the boulangerie might shut down before my writing does and I’ll miss out on one of its delectable patisseries. I consider going out in my loose pyjamas but something Sarah Turnbull said in Nearly French makes me reconsider. She wrote that she was about to pop down to the boulangerie in her tracky-dacs for the morning baguette and her french boyfriend was horrified. ‘That’s so selfish,’ he said. ‘How is that selfish?’ she asked. I was wondering the same thing. It took me a moment to get my head around that french perspective – that if I don’t make an effort to look nice it’s the people who see me who will suffer for it. So not owning a pair of loose pyjamas like Billie Dove‘s I get dressed. I even apply a little blusher. I go two doors down to the boulangerie. I walk in the door and see straight away that something terrible has happened. Madame, a little coiffeured ball of energy, is throwing her hands about, shaking her head and talking as loud and as fast as an auctioneer. She has an audience of two. They turn to look at me. I must be fascinating because no one looks away and although Madame slows down she doesn’t stop talking. I wonder if they’re admiring my blusher. ‘Bonjour,’ I say to break the spell. ‘Bonjour,’ they chorus and Madame revs up again. One woman backs away and disappears out of the door. The other points towards a pear tart and tries to speak. Madame’s hands and tongue are in full flight again. I catch odd words and phrases. Read the sign language. This is what I think horrified Madame. An architect and holder of many official titles in the village has been driving recklessly around the streets. His car has turned corners on two wheels. Mounted steps of the houses that line the streets. What if there were children going to school! What if his car toppled over the ramparts! Today he stopped in front of her shop. She ran out to confront him. She told us, me included now, what she said to him. I didn’t catch what she said but there was no mistaking the ferocity in which she spoke to him. His reply obviously enraged her and set the tremble in her voice. He didn’t remember doing any of that. I wonder if one of the official titles I missed was parliamentary representative. Finally she serves the customer who has been cut off from asking for the pear tart five times.The woman puts the money on the counter and doesn’t wait for the receipt. I buy a sugar brioche and Madame repeats what she told the others. I shake my head like I know exactly what she is saying. As if I am one of them. At home I start to write. Time moves somewhere else and takes my patisserie with it. It’s already lunch time when it comes back to find me. My writing is loose and casual, even though I’m respectably dressed and wearing blusher. I’ve filled page after page after page. This entry was posted in Travel, Writing and tagged dream, France, Menerbes, travel, writing. Bookmark the permalink. Great story! 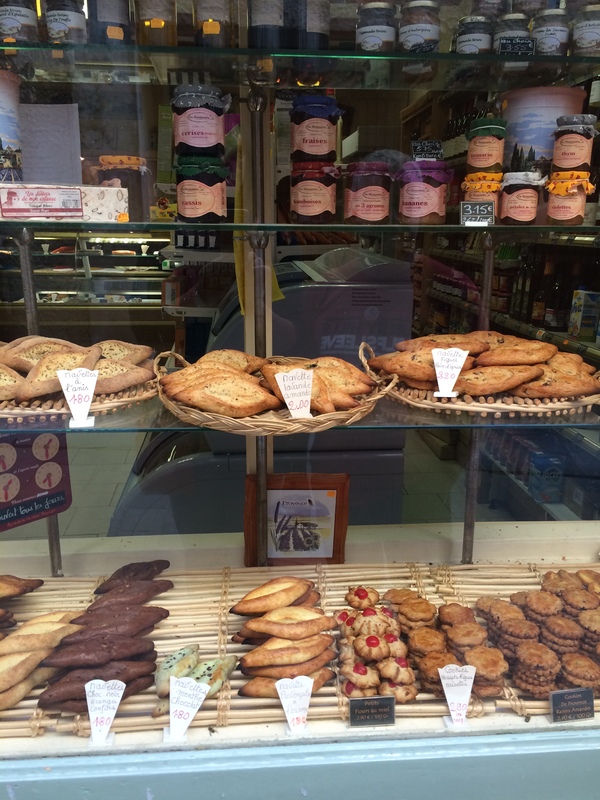 You have evoked many memories, of French boulangeries and being confused by language. Thanks, Anne. I’m glad it bought up memories for you. Thanks for reading. Oh, Karen! This is such a light-hearted account of your Sunday morning, it lifted my already cheerful spirits. So beautifully written I was right there in the boulangerie with you and Madame. I particularly love “Time moves somewhere else and takes my patisserie with it.” Even as I write this reply, my cuppa has turned cold. The bane of a writer’s life – cold coffee! I’m pleased you enjoyed my french experience, Diana. I love the theatrics of it all. I could see it unfolding in front of me as I was reading. Great inspiration for story writing; Madame, a sugar brioche and a reckless driver! Keep writing. Thanks for reading, Maree. There is inspiration everywhere for stories, but the funny is that it triggers stories about home rather than about here. As if by observing France I see my own country through new eyes. I love that you’re having good writing days! And interesting that being in France makes you think more of home. Your French must be pretty good! I had a similar experience in Spain where I was translating for my mum that didn’t go so well… What I’m sure I heard was the story about a nun with 32 children. Perhaps I got a word wrong here and there but in the end my mum was in hysterics. I love your story about the nun with 32 children, Jessie. That’s funny. I suspect I don’t get it right most of the time but I’ve earned a diploma in sign language. Thanks for reading!